Why would you choose custom clothing for your business, charity or club? Isn't it a bit of a luxury, an expense that could be better spent elsewhere? Allow us to disagree. Custom clothing is important. The reasons why are as clear and simple as ABC. A is for Awareness. Awareness of your product, your organisation, your event. It's a great way of making sure that people know the reason you're around. B is for Brand. We all have an item of clothing somewhere in our wardrobe that bears the logo of a manufacturer or designer. It makes you aware of the brand. It also helps with identification of staff in a store, restaurant or hotel. Has anyone ever asked you to find them something in a shop when you don't work there? Branded custom polos or t-shirts helps to avoid those embarrassing moments. C is for Community. Custom clothing can help clubs and organisations to bond, to feel that they're part of something bigger. Look at the clothes that the T-Birds wear in Grease. Or the cool shirts ten-pin bowling teams wear. Custom clothing can help you show support for a cause or an idea, too. Look at the shirts that Fact Fashion put together raising awareness of third world poverty. Or Katherine Hammett's Choose Life shirts. Here's a suggestion. Artist Rob Ryan, best known for his bright, detailed papercut and screen print work, has teamed up with fair trade accessory specialists NV London Calcutta to produce the limited edition "Small Girl" scarf. Made of silk, probably the most ethical of materials, the red, white and blue colour way gives you a chance to support the team without covering yourself in Union Jacks. I'll be looking more at ethical alternatives to the approved Olympic wear over the next couple of weeks, but the Small Girl scarf seems like a classy place to start. Bag your Small Girl scarf at the NV London Calcutta website. If you fancy a light read that gives a surprisingly nuanced view of the global fashion business, then I can recommend Where Am I Wearing? Kelsey Timmerman's 2009 book documents his travels as he tries to find the people that made the clothes that he wears on a daily basis. He would travel to Honduras, Bangladesh, Cambodia and China, and discover that there are no simple answers to the dilemma of ethical fashion. There are solutions, and they're not cheap. But along with most of us, Timmerman wants to see an end to a global economy that is so obviously skewed away from fair trade and towards exploitation. His book, as relevant now as when it was published, is a great way of raising awareness towards that aim. In fact, the revised edition of the book visits a fair-trade factory in Ethiopia which shows what can be done with a remarkably small set of resources. If you're interested in ethical fashion, this book puts a smiling face on the stories behind the cheap t-shirts and flipflops. Where am I Wearing? : A Global Tour to the Countries, Factories, and People That Make Our Clothes is available at Amazon, and probably other good retailers as well. So, the racks and bags have been packed away, the tables have gone back in the garage. The Eco-Technology Show is over for another year. It was a fun experience, and it was good to meet so many of our old friends, and to make new ones. It was great to meet up with people like John at Fair Corp, who tipped us off about their new range of cycling gear (of which more in the next post!). It's kind of hard to tell whether the trip was worth the time and effort at this stage. Shows like this are primarily an awareness exercise, getting the name out to people who haven't heard of us or what we do. And it's a long game - Pier32 didn't actually sell anything at the show. But if we get a few good contracts out of it - and we did chat to a couple of exciting people with some thrilling opportunities - then who knows? You could well see us back in Brighton next year. I'd also like to announce the winner of our prize draw. A goodie bag (made from recycled drinks bottles) full of organic t-shirts and chocolate will be on it's way to Mike Monk of Brighton. Congratulations, Mike. For now, though, it's back to normal for us. This is Rob for TeamPier, signing off from Brighton. 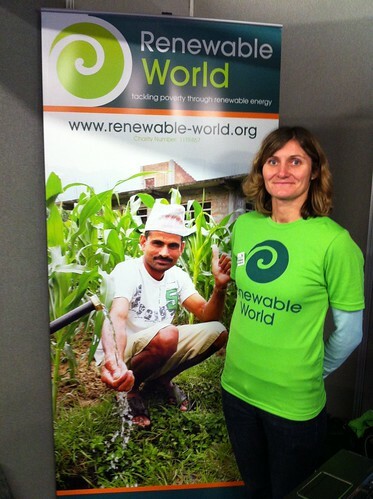 Meet Sarah Farney of Renewable World. They are a charity that believe in tackling poverty through renewable energy. Regular Pier readers will be aware how enthusiastic we are about the use of technology and smart thinking to help communities improve their own lives. Renewable World addresses those problems simply and directly. They use renewable energy sources like solar and biogas to transform the lives of those living in energy poverty. It means that children don't have to spend their day fetching water and fuel, and instead can go to school. It means that poor communities in countries like Mozambique, Tanzania and Nicaragua have a chance to live, rather than simply survive. Renewable World are at Bio-Technology to raise awareness and to get people to sign a pledge to make a difference to energy access and renewable sources. They're running an awareness campaign in Germany this weekend, for which Pier32 supplied the shirts. And Sarah's sporty green number is a Pier32 special too. There's loads more about the good work Renewable World do on their website - do have a look. Meet Ptolemy Elrington. 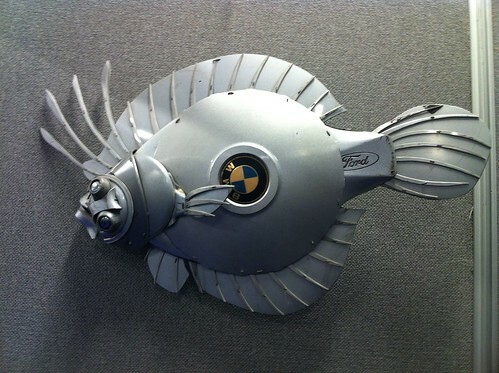 He's the master and commander of Hubcap Creatures, a company that retasks one of our ugliest examples of urban waste into objects of real beauty. His work takes the idea of recycling and uses it to talk about the nature of value - a process he calls redesigning. Hubcaps are carefully designed and well-thought out objects that abruptly lose their worth once they are separated from the car. Ptolemy gives those objects a new lease of life, a reassertion of value. 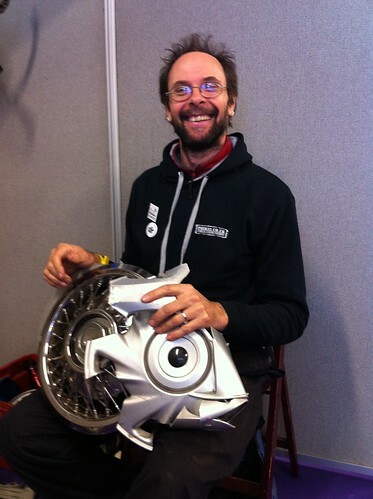 He gets his hubcaps from donations after years of kerb-surfing, including a recent gift of 1000 from the Eden Project. 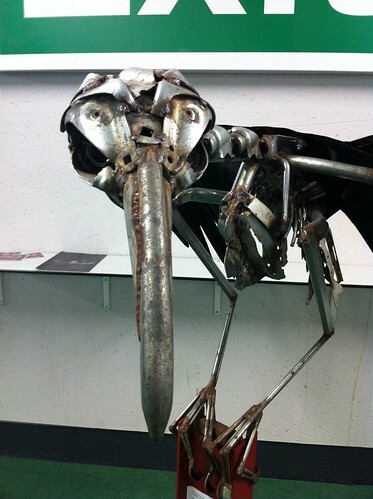 He also works in scrap metal, providing some striking objects for the show that are already photo-opportunity favourites. Ptolemy is a lovely chap with a real sense of what's important in the workplace. His enthusiasm for the craft is absolutely infectious. You might notice that he's wearing a Pier32 top as well. We believe in sharing the love around. 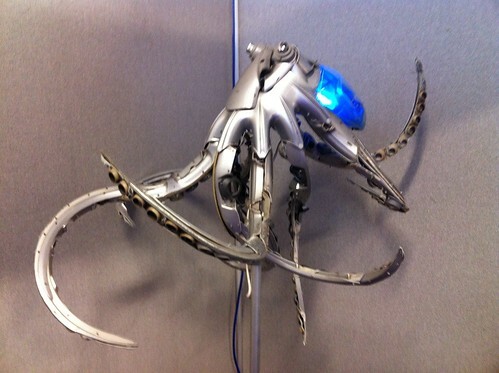 For more, including details on how Ptolemy could make your own commissioned hubcap creature, check out his website. 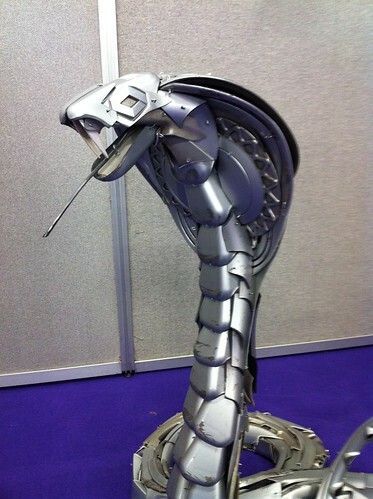 Good morning from Brighton, and the public day of the Eco-Technology Show. The show has just been opened by the Mayor of Brighton, who made the salient point that where 5 years ago, a show like this would have been on the margins, it's now very mainstream. The green sector is a job creator, helping to save energy and money for families whose finances are being squeezed more than ever. Lots to come from the blog today as we highlight some of the more interesting people at the show. As ever, if you're at the Amex Stadium, come down and see us! rather cool electric cars. I'm no petrolhead (in fact you can tag me as a two-wheels-and-pedals kind of guy) but there's something kind of intriguing about a plug-and-play ride. This is the Tesla, the world's fastest production electric car. 0-60 in 3.7 seconds. Scary quick. This is the Lightning GT, a British made all-electric super car. There's a distinct Jaguar-esque vibe to this one. If James Bond went green, this is the car he'd drive. Two wheels good. This little beauty, from Weald EVT is at the show to help support their effort to break the world drag-race record for electric cycles. Which currently stands at 201mph. Then there's this. The Renault Z.E. is a two-seater runabout (yes it is, the passenger sits behind the driver) that's very much on the low-cost, tiny emission end of the spectrum. I don't fancy it's chances on the M6 at rush hour, but as a quick, nippy city car it has a certain attraction. I can see the Top Gear guys would hate the Z.E. All the more reason to support it. We're set up, we're here and we're ready. Good afternoon, all. Pier32 is live at the Eco-Technology Show in "sunny" (yes, alright, spitty rainy Brighton with occasional glimpses of watery light). Today is business day. 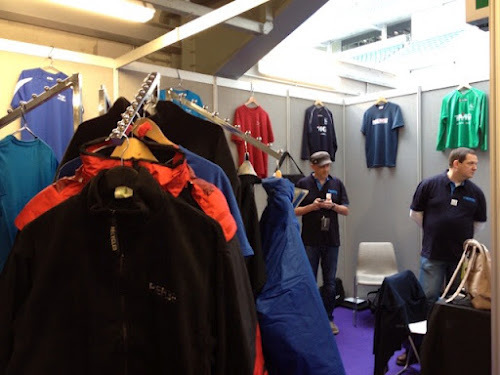 We're getting interest from companies looking for ethical solutions to their promotional clothing needs. And there are plenty of businesses here. Everything from solar and renewable energy to organic food and drink. A broad spread that shows just how wide-ranging the ethical and sustainable field has become. And this is before we look at the electric car test track. Footage from that later in the weekend. If you're at the show, you can find us next door to the seminar arena - stand E1 and E2. Come and say hi. We have sweets, and a prize draw with a chance to win a goodie bag. I know it might seem a little early to start thinking about the weekend, but that's exactly what we're doing here at The Pier. No, we're not slacking. You see, the Eco-Technology Show is on in Brighton this weekend, and Pier32 will be there. It's your chance to meet Guru Ian and I, and see our ethical take on the promotional clothing scene. We're proud to be a part of this national showcase for green technology and innovation. It promises a unique mix of business, decision makers, subject specialists, policy makers and buyers over a two-day event that's guaranteed to inspire and excite you! There's free workshops, a sustainable food market and lots more. It's on at the Amex Stadium in Brighton on Friday and Saturday. You can find us at Stands E1-E2 in the Information, Education & Lifestyle Zone in the East Stand, and we'd love you to come and say hi. Let us entice you with our special offers and rates for the show. And don't forget, we're still offering free tickets (normally a fiver) if you book through the Pier32 website. For more on what to expect, the Eco-Technology Show website has all the news. See you there! Upcycling or buying second-hand can be rewarding and economical. It can also be a little heartbreaking. Say you've found the perfect top. Lovely fabric, just the right colour. But the designer has slapped a print over the top that puts you right off the purchase. A real shame. But new inks developed by Dutch company Refinity could solve that dilemma. They can be removed from a garment, allowing it to be reprinted, extending the life of the piece. The inks, and the process used to remove them are non-harmful, while remaining machine washable. Refinity are working on ways to refine the process, adapting the ink for different types of fabric, and, by shredding and re-weaving cleared garments into fresh threads, helping to create a cradle-to-cradle service for their goods. Creating clothes that aren't stuck in a short trend cycle shows an innate understanding of green issues. Sustainability has to be about creating clothes that last, and Refinity have done just that. For more on Refinity's Removable Prints, hit the link. It's important to get started early when you're working with ideas about ethical fashion. The youth market is big on cheap and disposable clothing. Just look at your average Primark on a Saturday afternoon. Get the idea into the youngun's heads that there are alternatives, and who knows what you can spark off? Five young people from North Yorkshire have found that spark. The teens have put together Fact Fashion, an initiative that puts hard-hitting statistics about world poverty and injustice onto a range of clothes and accessories. The clothes are colourful, and assembled with a sharp eye for bold graphic design. I'm reminded of Katherine Hamnett's t-shirts back in the eighties. It's a great way to engage a large audience on ethical issues, and it's already seen some success, winning Fact Fashion the top prize in CAFOD's "Solutions For The Planet" competition and, last week, the Ecover Ethical Kids nod at the Observer Ethical Awards. There's a long way to go yet, of course. The kids are looking for funding, and I hope they find suppliers and manufacturers that have a decent ethical background. But it's a great first step, and here at The Pier we wish them every success. For more, have a look at an overview written by James, one of Fact Fashion's founders, or check out a short promo video at the Guardian. There's been a little bit of good news for charities this week, as George Osborne quietly dropped plans to cap tax relief on charitable donations. If carried to law, this would have put a sizeable dent in the revenue stream of charities that are already struggling with a brutal regime of funding cuts. As I mentioned when The View From The Pier first reported on the Chancellor's plans, inhibiting tax relief on donations in this way would have been the final straw for some charities, at a time when they were being asked to take up much more of an active role in community work. As well-off donors abandoned them, they simply wouldn't have been able to cope financially. But the plan was badly-thought out from the start, and targeting the wrong sector. Let's be clear, gift aid and the current rules on charitable donations are not tax dodging - tax payers don't make any money for themselves using the loophole. They are simply ensured that all their money is going to the right place. One could be churlish and point out that there's never been any question of capping donations to political parties - who similarly depend on large contributions from a small number of wealthy donors. Wealthy donors who also put a lot of money into charities. But let's be (if you'll excuse the pun) charitable, and just be grateful that young George has seen sense. In a week of U-turns, this has been a most welcome change of direction. Celebratory pasties for lunch all round.